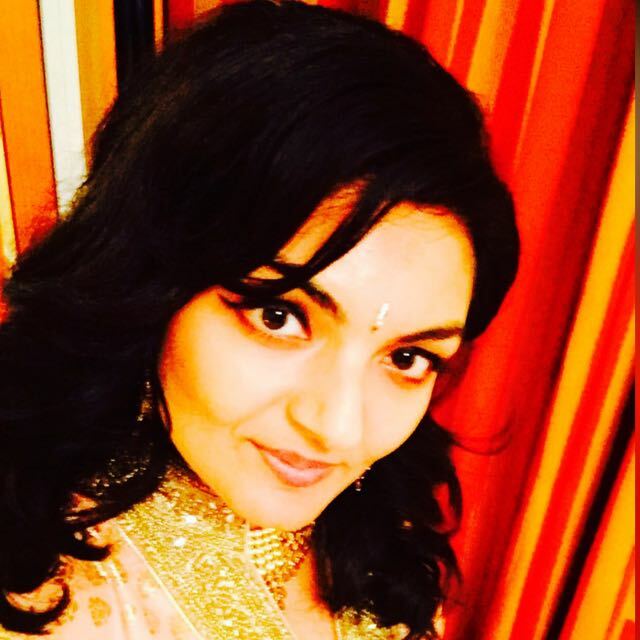 HomeLifestyleScienceIs There Scientific Consensus on Anthropogenic Global Warming? 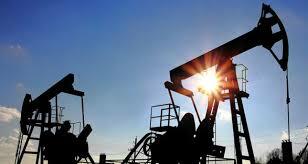 There is no doubt that the very concept of anthropogenic (man-made) global climate change is a contentious one, particularly among those that lean politically to the right. As a scientist, this issue has interested me since the scientific community began to research the idea of the ozone hole in the mid-????s. 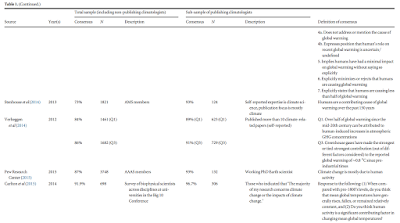 A study back in 2016 by John Cook et al entitled “Consensus on consensus: a synthesis of estimates on human-cause global warming” takes an interesting look at the scientific community as a whole and its consensus on whether humans have caused global warming. 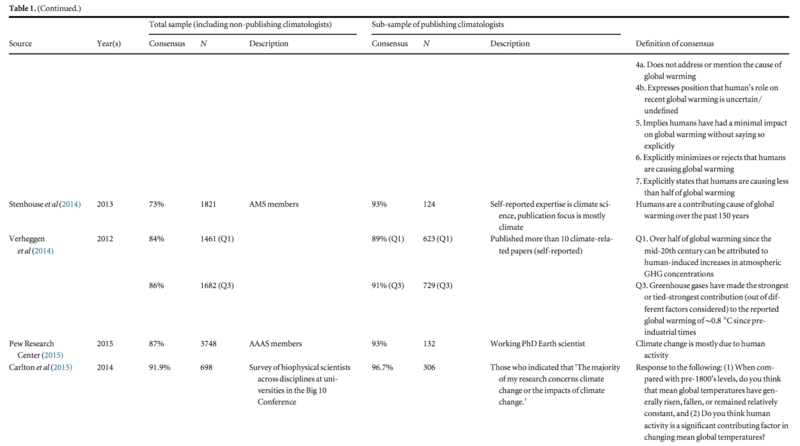 For the purposes of this study, the authors looked at the opinions of scientists who have published peer-reviews research in the climate science domain and terms them “domain experts”. This is in contrast to some studies which have looked at the consensus of scientific opinion using non-experts, that is, scientists who are either not experts in the field of climate or scientists who have not published peer-reviewed research. 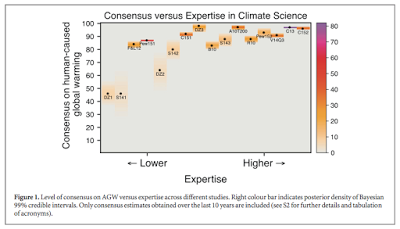 “We have shown that the scientific consensus on AGW is robust, with a range of 90%–100% depending on the exact question, timing and sampling methodology. This is supported by multiple independent studies despite variations in the study timing, definition of consensus, or differences in methodology including surveys of scientists, analyses of literature or of citation networks. Tol (2016) obtains lower consensus estimates through a flawed methodology, for example by conflating non-expert and expert views, and/or making unsupported assumptions about sources that do not specifically state a position about the consensus view. An accurate understanding of scientific consensus, and the ability to recognize attempts to undermine it, are important for public climate literacy. 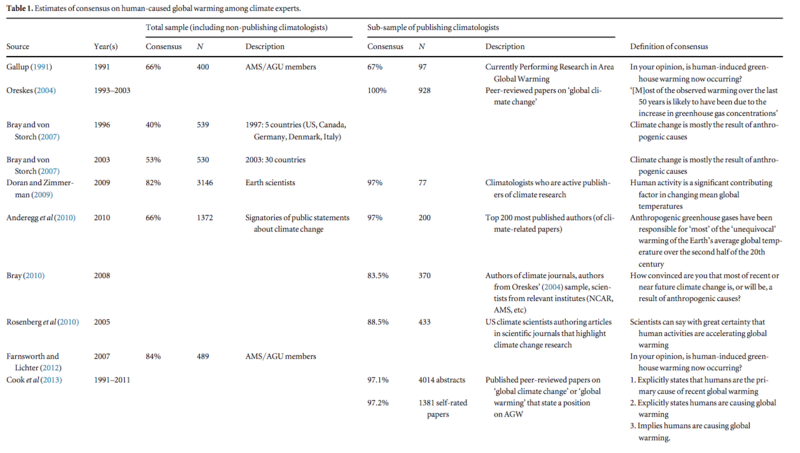 Public perception of the scientific consensus has been found to be a gateway belief, affecting other climate beliefs and attitudes including policy support. 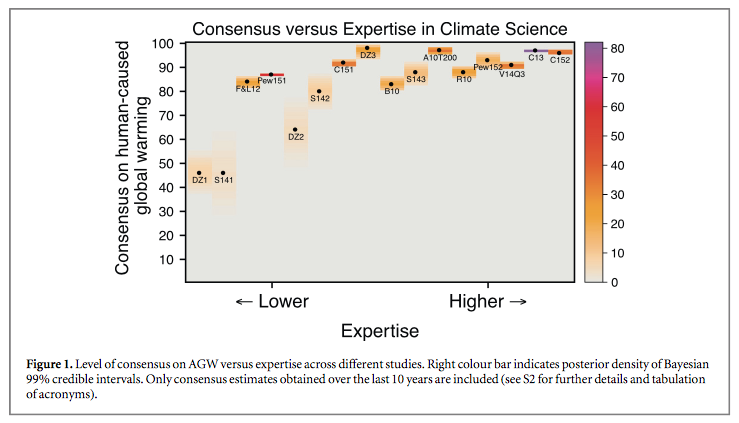 However, many in the public, particularly in the US, still believe scientists disagree to a large extent about AGW, and many political leaders, again particularly in the US, insist that this is so. Leiserowitz et al (2015) found that only 12% of the US public accurately estimate the consensus at 91%–100%. Further, Plutzer et al 2016 found that only 30% of middle-school and 45% of high-school science teachers were aware that the scientific consensus is above 80%, with 31% of teachers who teach climate change presenting contradictory messages that emphasize both the consensus and the minority position. 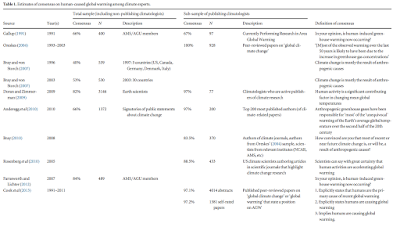 At the very least, the conclusions drawn by this study suggest that there is far greater consensus among qualified climate scientists than many climate change naysayers would suggest. This should give us reason to more closely examine the comments made by those politicians that we have elected to make decisions about our futures when it comes to dealing with the climate change dilemma.